This MT-10 isn’t even supercharged! Extreme Creation’s supercharger set-up will add almost 100hp to the R1 based motor. The last thing Yamaha’s new MT-10 needs is more power. 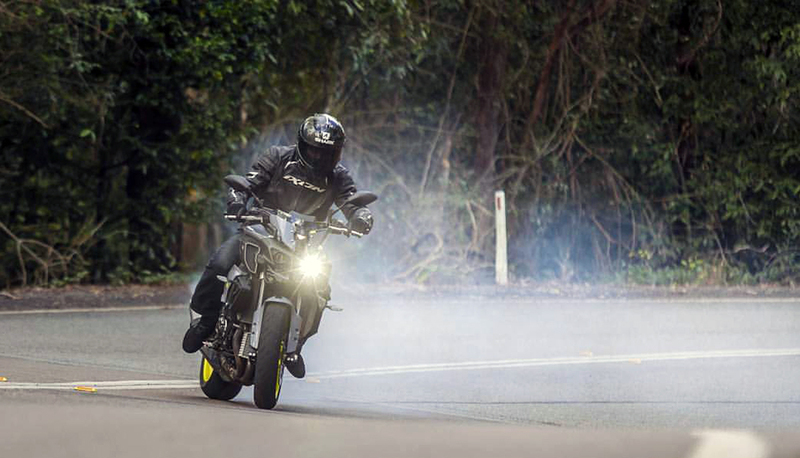 The biggest MT’ will happily wheelie through its first three gears and with a freer flowing exhaust system attached to the R1 derived four-cylinder, it’s proven to make over 160hp at the rear wheel – all while delivering the same amount of torque as the R1, but 2500rpm earlier. However, if you listen to Yamaha, the MT-10 is focussed purely on street riding at useable, public-road speeds. Yeah, right! 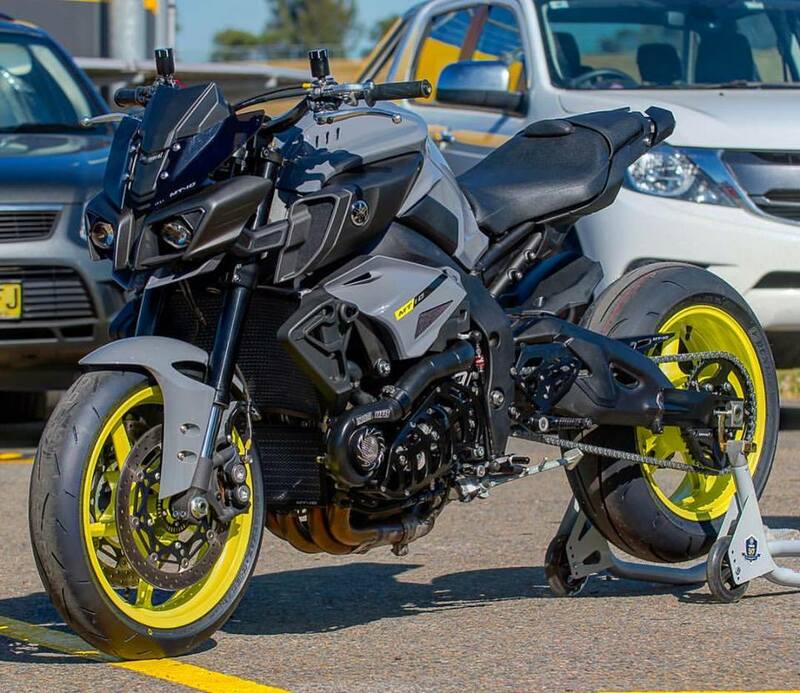 To clear up the confusion about what the MT-10 is actually about, Australia’s Extreme Creations are putting the finishing touches on a world first – a centrifugally supercharged Yamaha MT-10. Not content with the stock bike’s ‘big bang’ four-cylinder, the boys have decided to cram enough boost down the 1000cc’s throat to make 250hp at the rear wheel. Luckily this MT-10 isn’t destined for the hands of a mere mortal. 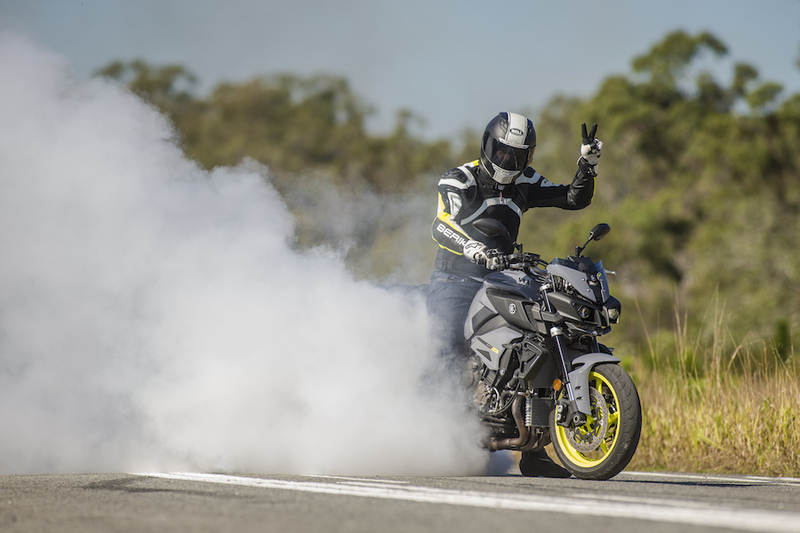 It’s set to be ridden drifted by stunt rider Dave McKenna, who’s familiar with Extreme Creations’ work, using a turbocharged MT-09 to destroy tyres for the past year or so. Obviously it’s not just case of bolting a supercharger onto the bike and hoping for the best – some serious head-scratching and engineering has gone into this project. According to Ben Shaw of Extreme Creations, the biggest problem was finding room for the supercharger unit itself. Off the shelf items would have required, in Ben’s words “serious modifications to the exhaust and radiator/cooling system”. Not one to shy away from a challenge, Ben decided to build his own supercharger! The custom set-up has both the inlet and belt drive on the same side, making it far narrower than other options. Supercharge an MT-10 they said. It’ll be fun they said…Keeping the supercharger in-line with the crank and ensuring it didn’t hang out in the wind was one of Extreme Creation’s many engineering issues. This was an important consideration as the supercharger needed to be kept in parallel with the drive off the crank’ to ensure no belt throwing histrionicss ensued. However, the bike still needed to be slim enough to handle some serious lean angles without dragging that custom supercharger up the road. 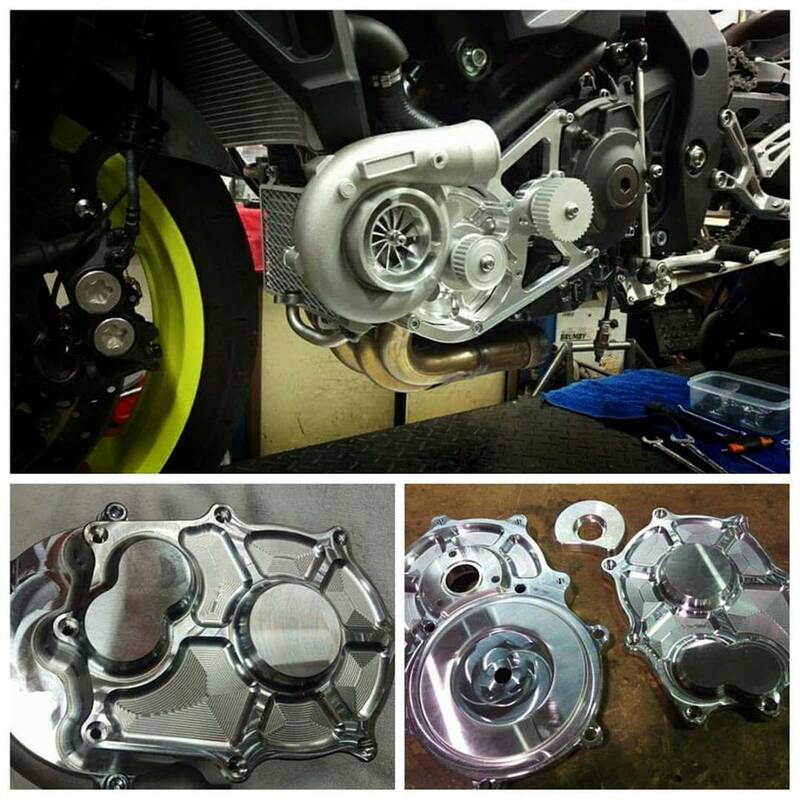 As you can see from the pictures above, turbocharging a bike looks like a cake walk compared to this project! Ben said he spent many hours researching the in’s and out’s of centrifugal superchargers before deciding to take the path less traveled, but we’re pretty sure there would have been some stern words to himself in the mirror during the build process. Because McKenna plans on drifting the MT-10, not simply wheelieing into oblivion, the swingarm has had eight inches added to it thanks to billet extensions made in-house at Extreme Creations. Not a lot else is touched on the MT-10, the rear sprocket is bumped up to a whopping 62 teeth (!!! ), heavier clutch springs are added to the clutch pack, the rear brake caliper gets a friend and a second thumb operated throttle is added. Interestingly, the engine’s internals are standard despite the boost being pumped into it and the genuinely flogging that’s on the cards for this bike. So far the supercharged MT-10 has only been on static display at Sydney’s World Time Attack Challenge. Extreme Creations are still putting the final touches on the final tune and, I’m speculating here, that McKenna might be sorting his life insurance before piloting what has to be one of the most extreme Yamaha MT-10’s in the world. Somehow, I don’t think this one will be used for street riding at useable, public-road speeds…sorry Yamaha. Photos sourced from Extreme Creations’ and Dave McKenna’s Facebook pages. ← The X-ADV. A scooter no one asked for?